The Giza pyramid complex contains the fabled relics of Egypt’s Old Kingdom, constructed a whopping 4,500 years ago. 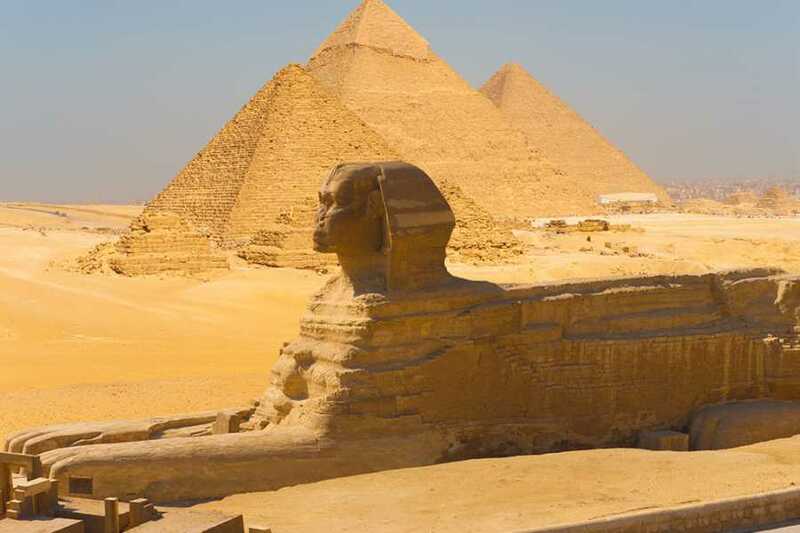 Get a peek at one of the world’s top historical attractions, which includes the Valley Temple, the Saqqara necropolis, and the mysterious, timeless Sphinx. First-time visitors to Egypt—or travelers short on time—will be able to tick off all the sights during this in-depth, full-day guided sightseeing tour from Cairo. Ancient Lower Egypt’s great rulers marked their territory with timeless monuments, larger-than-life relics of their once-mighty reign. In this in-depth, full-day guided visit to the Giza pyramid complex, get a firsthand glimpse of one of the world’s most powerful kingdoms. After front-door pickup from your Giza or Cairo hotel, travel back to the time of the pharaohs as you admire the massive blocks of the world-famous limestone pyramids. Learn about their hidden temples and chambers, witnesses to complex funeral rites. From there, head to the Valley of Temples, ruled by the mysterious, legendary Sphinx. Get a chance to snap unforgettable photos of the famous seated lion, whose head resembles the ancient King Chephren. After a savory lunch at an authentic local restaurant (own expense), visit the Step Pyramid of Saqqara, which marked a new style of monument, and the powerful statues of ancient Memphis, built in 3100 BC.